The PDF file format remains one of the most common document types in the globe. It is used for books, images, documents, texts and several other files that need to be stored in a format that is not easily altered. However, should you have a scanned PDF file that needs to be rotated, you may experience a challenge. The most recent version of Adobe Acrobat Reader only allows you to rotate the PDF file for the period which you are accessing it. In this post, we take a look at how to rotate a scanned PDF permanently on your Mac with PDFelement ProPDFelement Pro. The application allows you to edit as well as convert the scanned PDF files on your Mac. You can create new PDF files, combine or split PDF documents, compress them and do much more. You will be able to add personalized signatures, stamps, and passwords. It has ability to add markup annotations or crop a page among much more. PDFelement Prouses technology known as Optical Character Recognition to digitalize scanned PDF documents which allow you to copy, edit, and convert files based on images. You first have to download and install PDFelement Pro for Mac onto your Mac. And then follow the below easy guide to rotate scanned PDF on Mac. For windows users, you can download PDFelement ProPDFelement Pro for Windows. Once PDFelement Pro for Mac is installed, launch it and import the scanned PDF file that you need to rotate onto the application. To import the files, you should click the "Open File" button. You may also opt to drag the files onto the application. Once the PDF file is opened, it is ready to be rotated. Click on the "OCR" button under the "Edit" tap. And then you can select your language on the OCR panel on the right side of the program interface. The "OCR" function turns the scanned PDF into editable files. Once you have enabled the "OCR" function, you will realize that the scanned PDF becomes editable and gives you the option to either rotate to the right or left. You can navigate to Page menu. Click on the "Rotate" button. A pop – window will appear on the right side, choose your desired angle of rotation between 90 degrees and 180 degrees. In an ideal manner, your basic options are clockwise 90 degrees or counter clockwise 90 or 180 degrees. There is also an option for specifying the pages that you wish to rotate. Once you have been able to rotate the scanned PDF, make sure to save the file. Go to "File" and click "Save As". That's it. Your file is now permanently rotated. Tip: When using the PDFelement Pro for Mac and can't find the option to rotate Pages, click on the touchup tool as you hold down the control button on your keyboard then select "customize the toolbar" to find the options. 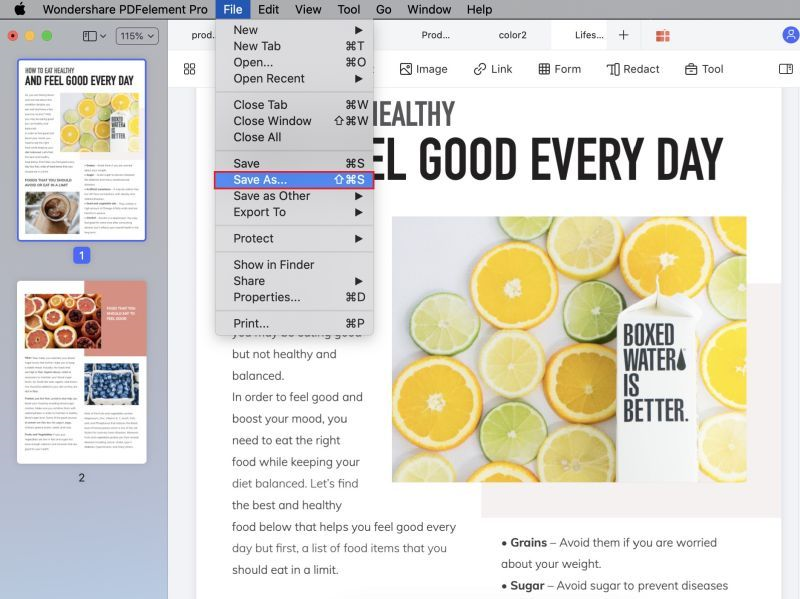 There exist several ways of how to rotate a scanned PDF but using PDFelement Pro for Mac remains the most efficient, easy, and effective method to date. If you have been having trouble reading PDF files because of their orientation, now you know what to do.